This is a transcendent exploration of the fascinating people, culture, and landscape of Japan. 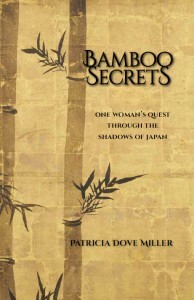 Patricia Dove Miller’s memoir Bamboo Secrets: One Woman’s Quest through the Shadows of Japan relates experiences both harrowing and beautiful with gentle clarity. It is also a celebration of Japanese culture, of nature, of love and relationships, and of the beauty found in the everyday ephemeral. At fifty-one years old, Pat is beyond ready to finally find her niche in life. When the opportunity arises to join her husband, an anthropology professor, in Kyoto, Japan, she embraces the adventure and challenge wholeheartedly. She immerses herself in traditional Japanese pursuits while exploring the countryside shrines, gardens, markets, and festivals, hoping that the trip will be a personal journey of discovery. Her entire world is turned upside down, though, when her husband is detained by a formidable group of Japanese officials. Unbeknownst to her, Steven has been struggling with marijuana use, a habit that places him squarely in the middle of a frightening investigation, costing him his job and freedom while upsetting the foundation of their marriage. Set in 1992 Japan, the rituals, ceremony, societal formalities, and expectations of the time all play a prominent role in Pat’s struggle to accept and understand her circumstances. Her respect for the culture is evident throughout, particularly as she shares her passion for shakuhachi (the bamboo flute), ikebana (the traditional art of flower arrangement), and forays into shod? (Japanese calligraphy), cooking, language, tea ceremony, and a variety of other traditional pastimes. Haiku, both from well-known Japanese literature and Pat’s own original verses, are interspersed throughout, adding to the text’s cultural engagement. A natural observer and observer of nature, Pat makes full use of the senses in her descriptions, whether the fall of light and shadow through a window, the texture of the tatami mats, the murkiness of a bowl of miso, or the smells of fresh ink, clay, and flowers. A complete and vivid picture comes to mind as these smallest details converge. Relationships are a bit trickier. Pat struggles to form lasting bonds within the complicated social hierarchy of students and teachers, sponsors, mentors, and the traditional roles of men and women. Bamboo Secrets explores Pat’s internal struggles and inclinations as a people pleaser, even as she seeks solace in meditation. A uniquely introspective character study emerges as she recalls events from her childhood and first marriage that had lasting repercussions. 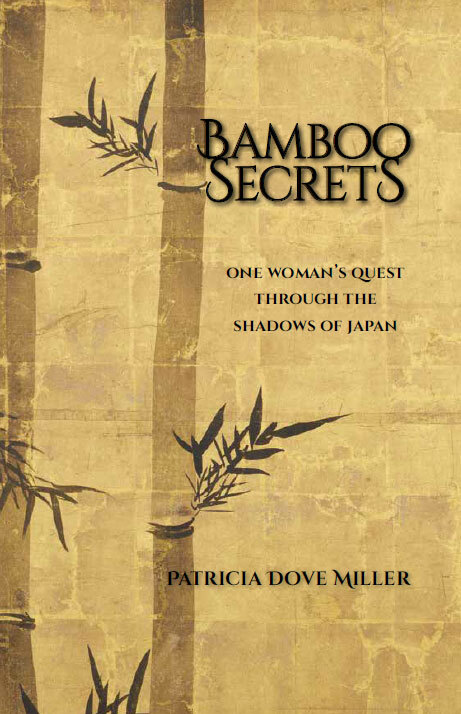 Patricia Dove Miller’s Bamboo Secrets is a travel adventure, a story of personal transformation, and an account of a legal battle, but above all it is an exploration of the fascinating people, culture, and landscape of Japan. This debut memoir recounts how an American woman’s planned sojourn in Japan becomes a tense bureaucratic nightmare after her husband’s drug bust. “dark side” comes off as alarmist, especially because the country has much darker sides. Miller’s view of Japan is somewhat rarefied, but she renders well her personal growth through speaking up, letting go, and attending to beauty. After a tense police station visit, for example, the couple decided to follow a canal—“Maybe it’ll take us home”—where Miller noticed a strong, graceful egret appearing to walk in meditation, “searching in the water for shadows.” Looking for home, occupied in mystery: a powerful image for Miller’s quest. A well-written, sensitive portrayal of coming to terms with a disrupted Asian idyll. You’d think that if you’d read a book five, six, maybe fifteen times, you wouldn’t want to read it yet again. But I did. I really did. In fact, when I finally got my very own ink-and-paper copy of my writing buddy’s book, “Bamboo Secrets,” and I started reading it, I could not put the darned thing down. I polished it off in a matter of days, forgoing my morning news fix with the New York Times and San Francisco Chronicle for the pleasures of another kind of reality — a painstakingly honest memoir. As the title suggests, Pat’s book seems to be about an American woman’s midlife search for identity during a lengthy, fraught stay in Japan. At least, that’s what I thought the book was about as Pat and I and our writer-musician friend Betsy Blakeslee shared manuscripts, talked about writing, ate, laughed and walked together — once a month, faithfully, for several years.But when I finally sat down to read the entire finished book, just me and the page, another story emerged. It was a theme I had known was there, but had not noticed. This was an honest-to-goodness love story. Along with her quest for her life’s purpose, Pat was telling the story of a marriage, a deep friendship with staying power. It was a marriage that endured the initial shock of the husband’s sudden arrest in Japan on charges of marijuana possession. It was a friendship that survived the months of isolation that ensued when the couple was shunned by friends and colleagues as Japanese authorities deliberated whether to sentence the husband to prison. Readers will enjoy the company of Patricia Dove Miller as she attempts to practice the Japanese arts of ikebana, calligraphy and shakuhachi flute. But for some, the real gift of this book will be the glimpse it gives into the practice of the more elusive art of marriage. Pat was my writing teacher for many years. She taught me much about good writing, and she was a great help to me as I completed my first book, Loss of Deliverance. After reading her book, I am even more inspired! I finished your book in the middle of the night at 35,000 feet over the North Atlantic. I love traveling on a plane or a train, especially long distances which remind me that I am a Person on a Planet who is trying to pay attention to things. Anyway, it was an ideal setting for completing your book. I didn’t start to cry until you got the phone call from the prosecutor. It had been very suspenseful. And then I cried the rest of the way through that last five percent of the work. I was so filled with feelings for you. And I loved the way you wove your story around the fabric of Japanese culture, especially the arts, ikebana, the shakuhachi, ceramics, and above all, meditation and the meditation inherent in all these practices. I loved the little details: how the Japanese women held their hands over their mouths when they laughed; the fresh smell of clean tatami mats; the proper way to sit for a woman, with her legs and feet tucked under. Being good to yourself about your regrets, being honest about your shortcomings, revealing yourself, not just your BEST self, being vulnerable to your reader. I appreciated that so much.